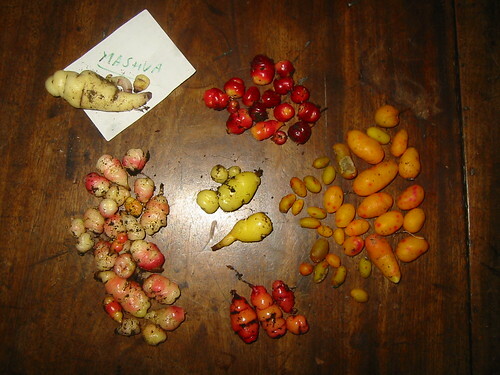 I've been watching the harvests of other more dedicated growers of Peruvian root crops as they publish their results throughout the autumn with some anxiety and anticipation for the outcome of my own lackadaisical efforts to keep a minimal stock in hand for next year. Finally the moment has come and I've emptied the small pots of my hopes and counted the yields. The photo is above. For scale the smallest ulluco pictured, the tubers to the right of the screen, are about baked bean size (that's a navy or haricot bean if you're unfamiliar with the term). There were a few rice sized tubers as well which I didn't photograph and a few chewed ones which might grow but didn't look very pretty. Overall I have to say that my total worth of ulluco is no greater than it was when I first obtained some tubers from Realseeds some years ago and the diversity has reduced. They sent me 3 or 4 varieties and I seem to have only the one, admittedly pretty pink spotted, sort left. The mashua, labelled, is the one left of the several sent to me by Rhizowen earlier this year. I'm glad to have brought it through but there's nothing to be proud of there and nothing to eat either! And so to the oca. Over the years I had accumulated five varieties, two which I obtained from New Zealand via Waitrose, a white one from Realseeds and two fairly similar pinky white ones from a kind swapper who's name escapes me for the moment (but I'll look it up when I can). It seems I only managed to put one of these into a pot last spring but we've had a mild autumn here and I'm reasonably confident that I'll be able to find volunteers in amongst the detritus of the vegetation which was last year's failed crops. By the way, there's no way of assessing the quantity of the crops from this exercise as the pots and culture for each example were all different; similar only in the lack of attention given to them. Other roots, the hopniss, tuberous rooted peas, chinese and jerusalem artichokes await closer investigations although I was reasonably confident that I had enough propagation material of these in October. Unfortunately while we were away we've had a plague of mice and all bets are off. So once again, I've scraped through, holding on to these novelties for another year. I'm still not convinced that as they stand they're worth growing for anything other than eccentric interest and I'm definitely not dedicated enough to contribute much to the very laudable efforts of others to breed adaptations better suited to European environments but my options are still open. I sense your general interest/disillusion ! It is a dichotomy, certainly. I had a poor-ish year in the vegetable garden - very wet and therefore cold from early on. Next year will see me with a much reduced area, I'm afraid. Since my yields of everything have always been low, it's hard to carry on wholeheartedly despite an ideological commitment. Hey-ho.